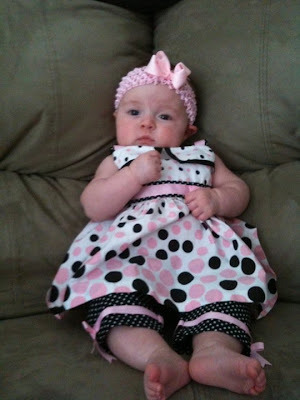 Life with the Lashers: Bella is 3-months-old TODAY! Today is Bella's 3-month "birthday"! There is no 3-month check up with the pediatrician so the stats are rough estimates conducted by myself and Ian. Eating Pattern: Bella eats 5-6 ounces of formula every 3-4 hours. Friends: Bella hosted her first "play date" on the 4th of July and had about 15 of her friends from MWI over for a 4th of July celebration. Current Events: In Tampa, 2 Tampa Police Department officers were shot and killed recently. The suspect was one the run for a few days, but turned himself in on 7/3/10. One officer left behind a wife and four sons and the other officer left behind a wife, who is 9-months pregnant. Our hearts go out to the families and hopefully justice will be served. Happy 3-Month Birthday, Isabella Eve!